Tamim Iqbal handed the 2nd Bangladesh Premier League (BPL) title for the Comilla Victorians who defeated the Dhaka Dynamites in the final by 17 runs. Tamim led the charge for the Victorians with a record knock of 141 coming in only 61 balls with 11 sixes and ten fours. The left-hander looked unstoppable in the 2nd half of the innings as he kept churning the boundaries to help his team finish with 199/3 in their 20 overs. Dhaka Dynamites were 102/1 in the 9th over but a collapse in the middle overs saw them making only 182/9. 141* – Tamim Iqbal’s unbeaten 141 is the highest individual score by a Bangladesh player in Twenty20 cricket. Tamim’s 130 for UCB-BCB XI in 2013 against Mohammedan was the previous highest T20 score by a Bangladeshi. 141* – Tamim’s unbeaten 141 is also the 2nd highest individual score in Twenty20 tournament final. The highest is an unbeaten 146 by Chris Gayle for Rangpur Riders in the 2017 BPL final also against Dhaka Dynamites. 70.85 – Tamim Iqbal accounted for 70.85% of Comilla Victorians’ total in the final. This is the 7th highest % of team’s runs scored by a player in a Twenty20 inning and the 2nd highest in a BPL inning. Chris Gayle’s 146* was 70.87 % of Rangpur Riders’ 206/1 total in the 2017 BPL final. 141* – The 141 by Tamim Iqbal is also the 2nd highest individual score in the BPL behind the 146* by Gayle in the final of the 2017 edition also against the Dynamites. 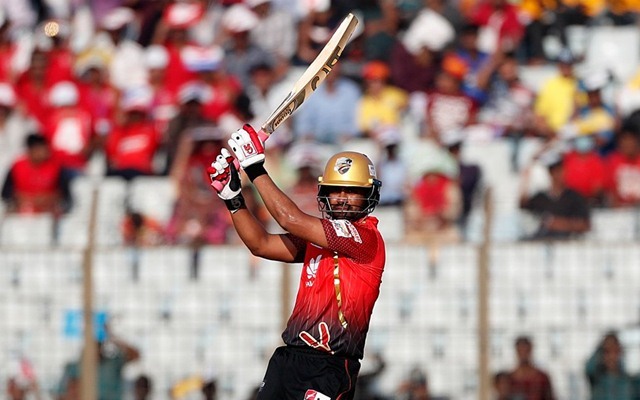 1825 – Tamim is now the leading run-getter in the Bangladesh Premier League surpassing Mushfiqur Rahim’s tally of 1783 runs. Tamim batted in 57 innings out of the 58 games he played while Rahim batted on 67 occasions in 71 appearances. 11 – Number of sixes Tamim Iqbal hit during his 141-run knock; the most by any player in a BPL innings whose name is not Chris Gayle. The Universe Boss hit 11 and more sixes on four occasions in a BPL innings including a highest of 18 in the 2017 BPL Final. Five out of seven instances of a player hitting 10 sixes in a BPL inning have been recorded by Gayle. Evin Lewis also of Victorians hit ten sixes during his century against Khulna Titans last week. 11 – Tamim became the first player from Bangladesh in the Twenty20 history to hit ten sixes in an innings. The previous most sixes hit by a Bangladesh player in a T20 innings was nine by Sabbir Rahman during his century in the 2016 BPL. 106 – Runs that Tamim scored by hitting boundaries; the 3rd most in a BPL inning. Chris Gayle hit 128 runs in boundaries in the 2017 BPL Final and 106 runs in the 2nd Qualifier in the same season where he struck an unbeaten 126 against the Khulna Titans. 106 – Tamim is also the first Bangladesh player to score 100 runs in a T20 innings via boundaries. The previous highest number of runs in a T20 innings that came through boundaries for a Bangladesh player were 90 runs by Sabbir Rahman during his 122-run knock in the 2016 BPL.